From Frascati, a town with a reputation for its white wine, we travelled to Castel Gandolfo, a town best known as the summer residence of the Pope. Castel Gandolfo is a small town with a population of less than 9,000 but when there is a religious event on or when the Pope gives an audience, that number can swell substantially, which we experienced during our visit. From the car park, it was a slightly uphill walk to Piazza della Libertà, the main square of Castel Gandolfo. We arrived at Castel Gandolfo at mid-day and the first we knew that the Pope was in residence was when we saw groups of French school kids coming from all directions. Each school group had different brightly coloured berets, caps and scarfs which is a clever way to identify themselves just in case a member of the group strayed from the flock. Unfortunately for us, we had just missed the Pope’s audience with the school kids. But on the upside, the hoards of students were just leaving and the main square was soon ours to enjoy. Castel Gandolfo has been the summer residence of Popes from the beginning of the seventeenth century. But, as early as the time of Emperor Domitian, Lake Albano and the Alban Hills have been a popular retreat for aristocratic and wealthy Roman families seeking relief from the summer heat. The Palazzo Apostolico di Castel Gandolfo (papal palace) was designed for Pope Urban VIII of the Barberini noble family. Members of the Barberini family also bought adjacent properties for their villas and successors of Urban VIII expanded on the papal palace so much so today a vast area of over 44 hectares of Castel Gandolfo is Vatican territory. During summer, many pilgrims, Romans and tourists come to Castel Gandolfo to attend the Angelus prayer by the Pope, when he is in residence at the Apostolic Palace. He reads the prayer from a balcony overlooking Piazza della Libertà. Although the papal palace is one of the main attractions on the square, the building is not open to visitors. Also on the square is the Town Hall, the Church of St. Thomas of Villanova which was designed by Bernini, several souvenir shops selling religious articles, cafes and a gelataria. The stunningly beautiful Lake Albano and the surrounding natural environment is one of the reasons why this town was so popular with the aristocratic families. There are several Pontifical Villas in Castel Gandolfo which were built by the noble families of the time, such as Villa Barberini, Cybo Villa and Villa Santa Caterina. Since the 1960 Rome Olympics, Lake Albano has been used as a training site for canoeing and kayaking and visitors can enjoy water sports here. But for us, this was a lunch stop and as we’ve heard so much about Castel Gandolfo’s porchetta, we made an energetic dash for Corso della Repubblica, the main thoroughfare of the historic centre. There are many restaurants and cafes here, but the one that we were recommended to try was the Hosteria La Fraschetta which is said to have the best porchetta in Castel Gandolfo. If you would like to spend a few days in this papal town, the Hotel Castel Gandolfo and Hotel Castel Vecchio are closest to the historic town centre. For all other hotels on Lake Albano or near Castel Gandolfo, see Here. Castel Gandolfo is about 24 km south-east of Rome and is easily reached by train, bus or car from Rome. For more about how to get to Castel Gandolfo from Rome see Here. 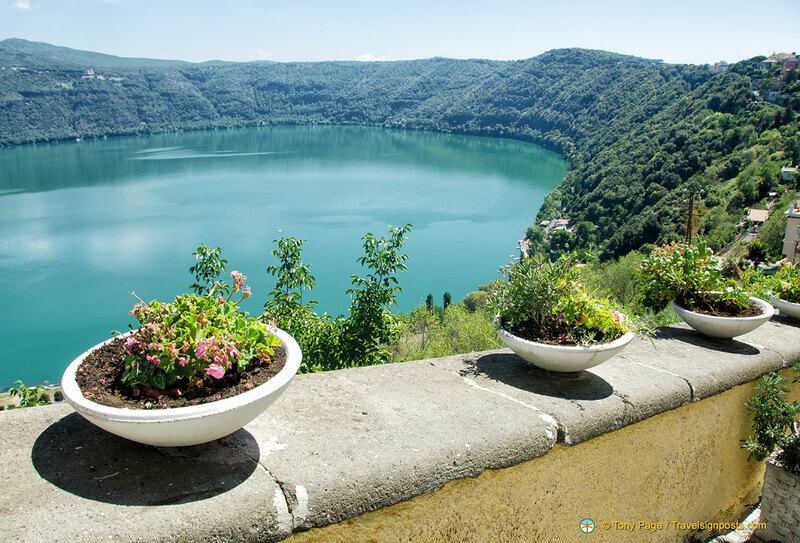 See more photos of Castel Gandolfo at Travelsignposts Castel Gandolfo album Here.